← Lancaster Green Is Residential Amenity Space….. The Council are intending to prepare a Supplementary Planning Document early next year. However, given the huge size of the site, and of the major development that is planned, it is likely that this project will be further progressed via a Development Plan Document, in which case it will be subject to examination by a Government Planning Inspector. This is also, of course, the site chosen by RBKC for the ill-fated crossrail station which ‘Transport for London’ and the Government have already decided will be best sited elsewhere – at Old Oak Common to be precise. We always thought this would be a far more appropriate site for the new Kensington Academy, which they are planning to shoehorn onto the Lancaster Green site. Everybody knows Lancaster Green is far too small for a school of this size. The proof of that pudding will certainly be in the eating – the new academy will have no external sports facilities, and will have a tiddleywinks sized playground. “The access to the site will be improved considerably by the area’s regeneration, however, the area will still struggle to accommodate high trip generating uses such as a secondary school. The area is located in a tight corner of the borough and is unlikely to address the needs of the borough. 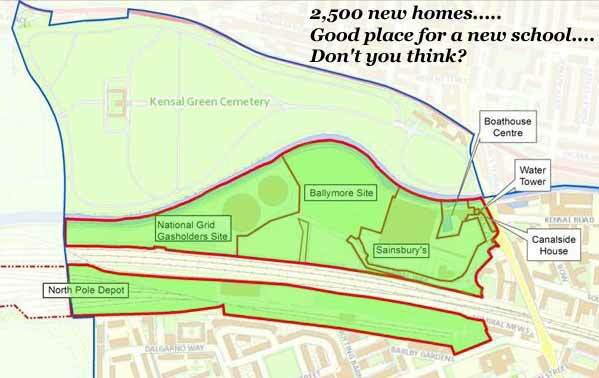 Pardon us for saying, but doesn’t this earlier statement completely contradict their more recent and far more grandiose ambitions for the Gasworks site? Black is white when it suits them, it seems, and two plus two is five.